Kaizer Chiefs’ management should shoulder the blame for the team’s continued poor cup run, after being knocked out of the Telkom Knockout semi-finals by archrivals Orlando Pirates at Moses Mabhida Stadium on Saturday afternoon. Going into this game, Chiefs had never lost a cup game to Pirates at the venue, but that good record is now a thing of the past. Another bad statistic is the fact that Saturday’s 2-1 loss was the second one in just under a month this season, following the league loss with the same score line on October 27, while it recorded the third Soweto Derby loss, in the calendar year, on the trot for the Naturena-based club. The 3-1 league win last season clearly started what has become a Soweto Derby downward spiral for Amakhosi. 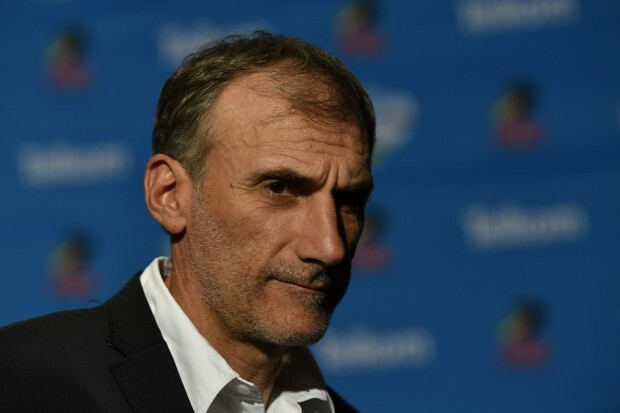 This was Giovanni Solinas’ second derby experience and, just like his first, he apologised to the supporters for the disappointing result. The Italian continued to be at a loss for words in trying to explain the team’s loss, lamenting missed opportunities. The man is really feeling the pain and the pressure is mounting. At the rate things are going, he may not see the expiry of his contract, something the club hasn’t done to their coaches in a long time. Why should Chiefs management shoulder most of the blame for the team’s poor showing so far and not Solinas? Well, the 50-year-old Italian mentor arrived at Naturena and was unveiled on July 13, 2018, with his club’s season-opener against Mamelodi Sundowns less than a month later. Logic dictates that a new coach, especially a foreigner who has been away from our league football for about two years, must have a pre-season camp with his new charges to get to know each other. That’s where he experiments with different combinations and introduces his philosophy while getting to know more about the club, the players and the expectations. Pre-season is a fundamental part of any team’s success, so it comes as no surprise that, almost halfway through the season, Solinas still seems to be in an experimental phase. He had no pre-season with the team, as assistant Patrick Mabedi was still holding the fort following coach Steve Komphela’s resignation towards the end of last season. Mabedi was in charge of the team’s pre-season training but had to be unseated when the new coach finally arrived at Chiefs. His first official game for Amakhosi was against Sundowns and they managed to hold their own, playing to a 1-all draw against the defending league champions. To say Chiefs’ form has flattered to deceive so far this campaign would be an understatement of note. There’s been no consistency despite the fact that, on paper, they have the best squad they’ve had in the last three seasons. Without pre-season camp for Solinas and his team, the Italian’s job was always cut out for him. He had his back against the wall from the onset. New players, new set-up, new pressure and expectations, there was no way Solinas was going to hit the ground running. Not in a million years! He doesn’t have a magic wand and hardly knew anything about his team. In fact, he’s still struggling to form any sort of understanding with his players. My gripe with this whole situation is the fact that Chiefs knew way before Komphela’s resignation that they were going to part ways at the end of the season, as his contract was coming to an end with nothing to show for as far as silverware is concerned. Even at the beginning of the season, Chiefs knew that Komphela wasn’t going to stay at Naturena beyond the end of last season. What did they do about it? Where was the foresight to start looking for a capable replacement who would turn things around and awaken this sleeping giant of South African football? Why did the team not secure the services of a new coach, say, by halfway through last season so that come the end of the campaign, the players would have been introduced to their new coach who would have had time to study and analyse the team before taking over? Following the three empty seasons, one would expect the club management to pull all the stops to ensure that they erase the painful memory of the last three seasons where, for the first time in the club’s history, they kept salivating at opposition teams ascending to the podium to collect trophies, medals and prize money. With the club’s rich history in cup competitions, you’d expect them to do everything in their power to hold on to their reputation and keep it intact. I can hear you saying Solinas was never the club’s first choice to take over from Steve and that they were forced to go for him, as they needed a new coach. That’s the word doing the rounds and it is fair enough, considering the open secret of the club’s failed attempt to bring back the last coach to win them any silverware, the current Bafana Bafana mentor, Stuart Baxter. The club’s chairman, Kaizer Motaung, is on record about their attempts to lure to the 65-year-old coach back to Naturena. Once again, Chiefs had more than enough time to get their act together and rope in a new coach while Jola (Komphela’s clan name) was still in charge of the team. It is that simple and if rumours of Solinas’ days at Naturena being numbered are anything to go by, Chiefs better make sure to do their homework this time around. They’ve lost thrice to a Pirates team that has been a work in progress. Pirates, for the first time in ages, went on a pre-season camp in Zambia, among other destinations, in preparation for the season ahead as well as their CAF Champions League participation. This was a clear and strong message about the club management’s intentions. Bucs now have a detailed plan for both domestic and continental commitments. Can we say the same about Amakhosi? Do Chiefs have a plan for the CAF Confederation Cup or is it just going to be another ‘let’s wait and see how far we can go’ kind of an arrangement? Maybe Solinas shouldn’t be the only one feeling the pain for the club’s poor Soweto Derby and cup competitions showings. Maybe, and just maybe, the club’s badge and the jersey isn’t only heavy on the players’ shoulders. Therefore, blame Chiefs, not Solinas for the current state of affairs at Naturena! When I penned a piece on my personal blog. I alluded more on why coaches are taking the blame instead of Bobby Motaung. ShakingInk blog has an article on 'Bobby or Komphela who is the real villian?" Another one is "Solinas misery piles up" we share similar sentiments Mr Joni. But Solinas will get a boot soon. Watch the space. The issue here is that Management is in a position to do something about this. Who should take blame for the poor planning for this season? They recruited the coach and within which time frames (Mr. Motaung Senior took it upon himself to recruit the coach for this season). The coach can't hire or fire himself........ and to be honest, this coach is still experimenting and does not know how to use his players, let alone understanding their strong and weak points in order to utilize them effectively and get a winning combination.